Workman Publishing Company, 9780761158141, 212pp. Who does not want to be healthier? Now in paperback: the book that Andrew Weil calls “offbeat, informative, and fun . . . a great read,” and that has been praised as “a delightful dance through science” (New York Times bestselling author Mark Hyman, M.D.) and as a “remarkable and insightful book [that] offers you the chance to achieve the best health of your life” (Mark Liponis, M.D., Medical Director, Canyon Ranch). a vegan, drink a tonic of brewer’s yeast. Exercise secrets—the benefits of lifting weights, the power of stretching. Environmental secrets—living in a Blue Zone, understanding the value of germs. Emotional secrets—seek out and stay in touch with friends, cultivate your spirituality. Physical secrets—nap more, take cold showers in the morning. And the wisdom that goes back generations: Yes, chicken soup works. The stories make it personal, the research makes it real, and the do-it-yourself information shows how to integrate each secret into your own life, and become the next person who never gets sick. 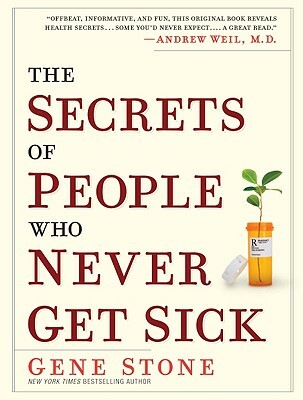 More than a how-to for staying well, The Secrets of People Who Never Get Sick is an entertaining—not to mention informative—lesson on health, history and human ingenuity.